"When New York’s Taxi and Limousine Commission held a public hearing last week to consider whether to raise taxi fares by 20 percent, cabdrivers pled poverty and passengers argued that fares are too high. Paradoxically, both groups were right. “Compete” may be the wrong word, however, since owners of the aluminum placards don’t have much experience with losing. Over the last decade, their victories have driven the price of a medallion from around $200,000 to more than $1 million in New York (see chart above). Medallion owners from Boston to San Francisco have been similarly fortunate, with medallions in Chicago appreciating even faster than the sustained 16 percent per year gains seen in New York. New York’s tight limits on the number of medallions in circulation has suppressed the supply of cabs. There are 13,237 medallions now outstanding, a few hundred fewer than in 1937, but a huge supply of drivers competing to lease them. In practice, a fixed number of medallions is just a fact of the system. In New York, Chicago, and Boston, the number of medallions has barely budged since they were issued in the 1930s. New York went 60 years without issuing new medallions, and it's only been a trickle since. Restricted supply makes for high medallion prices, and that in turn leads to consolidation in the industry. Only around 18 percent of cabs are owner-operated, putting most medallions in the hands of big taxi fleets or brokers who simply rent them out. The limited number of shifts and oversupply of drivers looking to work means that the fleets only rent out cabs by the shift, the shortest term, most profitable way possible." MP: The "lose-lose" outcome of a taxi medallion system is a good example of "crony capitalism" that has allowed a private taxi cartel to operate in NYC and restrict the supply of taxis in the same way that OPEC can restrict the supply of oil. 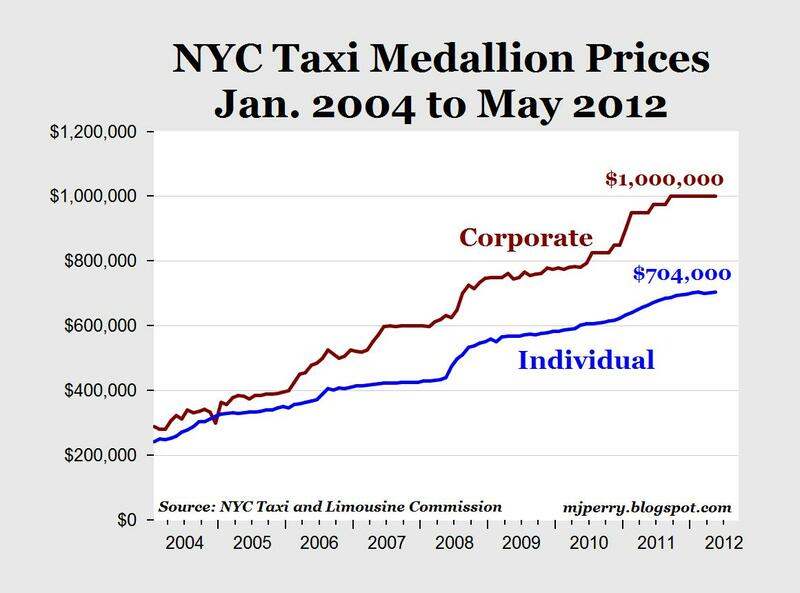 Consumers lose, taxi drivers lose, while the medallion owners prosper. What are the chances of any major changes to the taxi cartel? Probably none, as public choice economics would predict. The medallion owners are too well-organized, too entrenched in the status quo, and they have the financial resources available for rent-seeking to protect their cartel status. Taxi customers are dispersed and disorganized, and have limited resources to fight the cartel, so nothing will change. 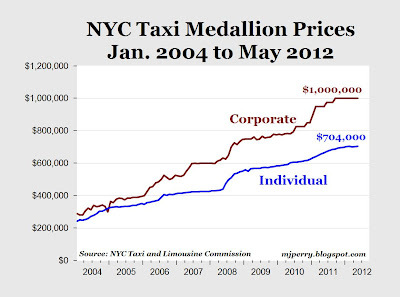 The NYC taxi medallion system cartel is a good example of "government failure" and crony capitalism that harms consumers and impoverishes the citizens of New York City, while enriching a small group of wealthy, politically-connected rent-seekers. Where's the outrage from the OWS crowd, this seems like it would be a good issue for them? What is the argument for taxi medallions? "What is the argument for taxi medallions?" From the consumers standpoint, the only reason I can think of is that they look good. They do look good. Have a retro feel to them. But, the medallions cannot be sold in the interest of public safety, as these things are freely tradeable. So, even if you were to limit the medallions to people who only meet certain qualifications, they can turn around and sell it to any schmuck. I mean, can any one give a good argument on why medallions are a good thing? i believe that early on the argument was that it protected drivers. back then, the medallion owner likely was the driver. the argument was that they were making an investment in the cab and wanted to be sure a glut of cabs did not drive returns down to the point where cabbbies would go bust. they also use a credentialing argument around "making sure cabs are high quality have qualified drivers and charge reasonable rates" and passed off a guild system as "consumer protection" the same way they argue that doctors, lawyers, barbers, and interior designers all need a license. it was the same tired, disingenuous line that every guild uses. we want high prices and limited supply for your protection. this case got particularly nasty as the guild masters figured out that they did not even need to work themselves, they could take all the money and make the journeymen and apprentices do the work for a pittance. customers overpay, those doing the work barely scrape by, and the guild prospers mightily from its entrenched redoubt and makes damn sure no one can enter the market and compete, which, as anyone who has ever tried to get a cab when the rain starts in midtown or on halloween or nye in san francisco can tell you, the customers could use. Is there a maximum number of cabs that can feasibly operate on New York Streets? If new medallions were to be issued today they would be auctioned off - just like new radio frequencies, or new gates at busy airports. The scarcity value would then accrue to the public. That would not be feasible for already existing medallions, so a better solution would be for NYC to tax the medallions. or, of course, they could just do away with the requirement that you need one to charge people for a ride and let this work like a market, not an oligopoly. consumers would get a lower price and better service. why keep medallions at all? Cab monopolies are the worst. In Las Vegas, it would seem like a no-brainer to extend the monorail to the airport. Instead, the cab lobby has blocked that, and this most obvious of extensions (which would decrease traffic on and near the Strip by a huge amount) is not being done. Ain't that the truth. It cost me about $20 (including tip) to take a taxi from the airport to my hotel (a distance of a little over two miles). I also believe that all the taxis and shuttles are owned by one company, but I may be mistaken on that point. The onerous partnership between government and medallion owners will be destroyed by magic phones and unlicensed gypsy cabs. fwiw, almost all the vegas cab cos will take you way out of the way and run up the meter. this is especially true of trips to the convention center. i notices that airport to CC they took the highway and they took surface streets going back. the trip back is $15 cheaper and takes half as long. i asked my cabbie about this and he said that the cab cos made the drivers take the highway from LAS to the CC to run up the bills. you will get a terrible runaround down there is you do not stay on top of the drivers. Very true. Fortunately, I was traveling with a friend who knows Vegas quite well. of course, if you want to have some real fun, cabs in eastern europe are about as bad as it gets. in prague, i had a guy try to overcharge me by 10x by pretending there was no decimal point on the meter. in slanchav brag (bulgaria) we got a guy who had hotwired his meter to run way too fast. 3 miles? 60 lev (around 30 euros). this notion of meters can work against consumers too. a bad map is worse than no map at all. personally, i like the carribean system: you ask: "how much to X?" they tell you. you haggle, reach a price, and go. you know what you are paying up front and the driver has incentive to get you there as fast as possible. paying a guy in a city you do not know to drive you by the mile/minute is like paying someone by the hour to paint your house and not even knowing how big it is. No. The number of needed cabs in any city changes from day to day and hour to hour. There is no "maximum number of cabs" any city needs. The idea that there is is what these rent seekers push in an effort to squeeze consumers as much as possible, while at the same time, eliminating any competition.